The following is a list of guild programs that were offered during the 2014-2015 guild year. Welcome Back, It's Time to Share! Show and Tell - Bring the items you have woven over the summer to inspire your fellow weavers. Also, if you attended any classes or had other weaving/textile adventures over the summer we would love to hear about them. 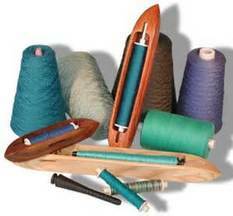 Yard Sale - Bring any yarn or equipment that you would like to sell to your fellow weavers. Book Sale - Some books from our library will be available for purchase. It is always fun to see everyone after the summer break and there should be plenty of time for socializing. 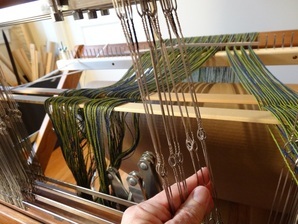 Over the summer, a new Triangle Weavers Guild website was born! Take a tour of the beautiful new website with Pattie. Check out the revised content that you are already familiar with. And take a gander at lots of new functionality including a beautiful Artist Gallery, new improved Resource pages, a feature rich Members Only section with online Yearbook, Newsletters, guild program handouts, instructions on how to access all of our Social Media, and much, much more! Leslie will show us how wonderful the guild Yahoo Group can be for communicating with fellow guild members. If you have been avoiding using this powerful tool, you will want to learn more! Janice Kohl will demonstrate how to make repair heddles ahead of time, before you actually need one. That way, when that threading mistake happens, you will be ready with what you need to fix it. You will just have to remember where you put it. Triangle Guild member Mary Anne is a relatively new weaver who has traveled to Thailand, Vietnam, Cambodia, Laos, Myanmar and Bali as well as China and Japan collecting textiles and stories all along the way. As she traveled she trekked and visited weaving villages and met weavers, documenting her visits with photos and textiles. She learned about how weavers in Myanmar are weaving with lotus stems and are still using the complex 100 shuttle weave or how Lao, Thai and Vietnamese women form formal and informal coops for economic sustainability for themselves and their families. Mary Anne will share photos, videos and textiles in a colorful and informative program. Mary Anne Kluger is a member of the Triangle Weavers Guild. Her focus is on experimenting with and using as much color in handwoven scarves as she possibility can! She began her career as a reporter for a small newspaper. After discovering that journalists work long, hard hours for no pay she moved into advertising in the media department for McKinney & Silver and then as media director for Howard & Taylor. She also served as the in-house ad manager for two other Triangle area companies. She now works with her husband (as little as possible), gardens, weaves and travels as much as possible. Enjoy a potluck meal, bring a fiber gift to exchange if desired, and participate as seller and/or shopper in our annual Weaver to Weaver Sale, while visiting with fellow weavers in a casual setting where we will draw cards for our Weaving Challenge for 2015. Contributions for various charities will also be accepted at this meeting to share with members of our community: preemie hats and bassinet blankets for the hospital, Linus Blankets for children with cancer, and hats, scarves and mittens for children (and parents) at the Women's Shelter. The items for children should be made with machine-washable yarns and bright colors. Thank you in advance for your generosity! The TWG January meeting has come to be known as the "round robin" where members share their expertise on various topics. This year we will have four topics and members can pick two 30 minute sessions. You don't want to miss this opportunity to learn and share with fellow members! 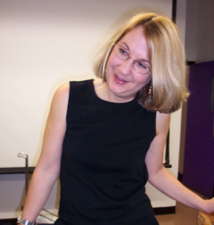 Daryl Lancaster, artist, teacher, hand-weaver, writer, and professional dressmaker/designer with over 40 years experience will be discussing her views and her perspective on hand-woven clothing, recycled experiences and the creative process. Daryl will talk about her adventurous journey over the years with hand-woven clothing showing images and samples of her fabrics and garments. *Please Note – This meeting is on the Friday prior to the weekend workshop given by Daryl Lancaster. 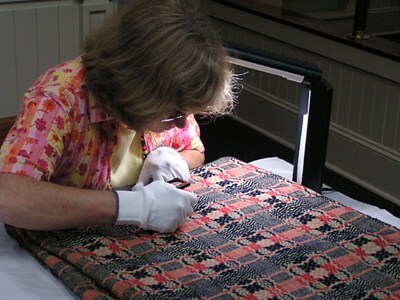 Linda Hardison will present an overview of North American coverlets with particular emphasis on her research and documentation of old geometric coverlets. A weaving class the summer after high school graduation began her lifelong fiber art interest. 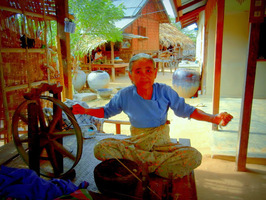 It was only later that she found out that her great-grandmother had also been a weaver and spinner. During her youth, she had put aside her loom and wheel (which Linda has) to knit socks and small pieces of lace. Over the years she added spinning, knitting and dyeing to her weaving skills. Collectively they enable her to realize her creative ideas and pursue many fascinating fiber projects. Her particular interest is historical/traditional weaving with an emphasis on hand woven bed covering, often referred to as coverlets. From spring to fall, she weaves regularly at the Bryant House Historical Museum in Moore County. Linda has been a member of Triangle Weavers for six years. She is also a member of Handweavers Guild of America, Complex Weavers, and the Sandhillls Handweavers Guild. The scarf is our most versatile accessory. Aside from adding color, texture and personality, a scarf can be turned into a head covering, sarong, belt, halter top, necklace, purse, bib and more. 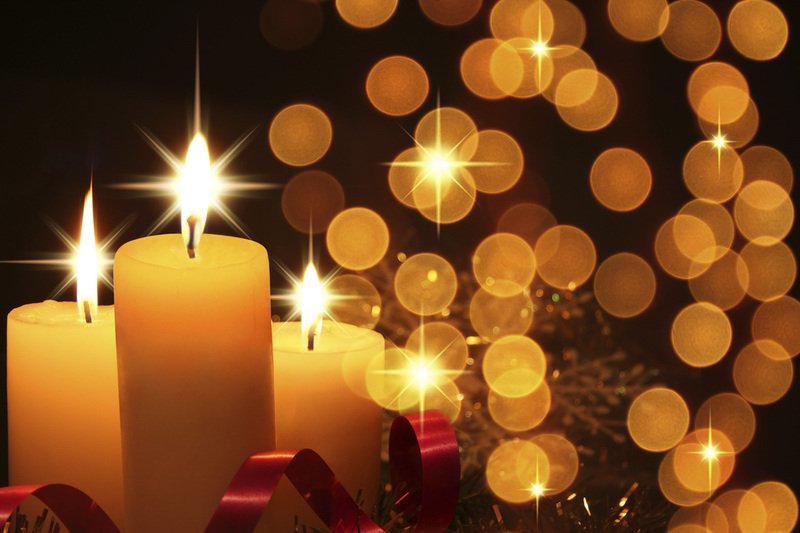 Join Debbie Suchoff for a fun evening filled with twists and turns. Learn some fresh/outside of the box ways to transform your favorite scarves. This is an audience participation program! Bring some scarves from home: handwoven scarves and shawls, lightweight silk scarves 8"x64", 36/38" square, maybe a pashmina shawl. Debbie Suchoff has done creative work most of her life. She has designed jewelry for over 25 years and is passionate about clothing and accessories. Fashion Savvy is Deb’s consulting business. She takes great pleasure in helping women connect with their unique style. to return to the Giver (with the option to weave two things and keep one).